In the early 1890s several writers suggested that a new fashion was taking hold among the urban women of Europe and America: drinking Eau de Cologne. Stories appeared in both medical journals and popular newspapers of women ingesting perfume in various ways – from the delicate act of swallowing ‘a dose of cologne dropped on loaf sugar’ to the unrestrained swigging of whole bottles of 4711. Mirroring recent anxieties about middle-class drinking habits, doctors and journalists emphasised that these cologne drinkers were usually well-to-do, wealthy, and respectable members of the community, sometimes even members of London ‘Society’. 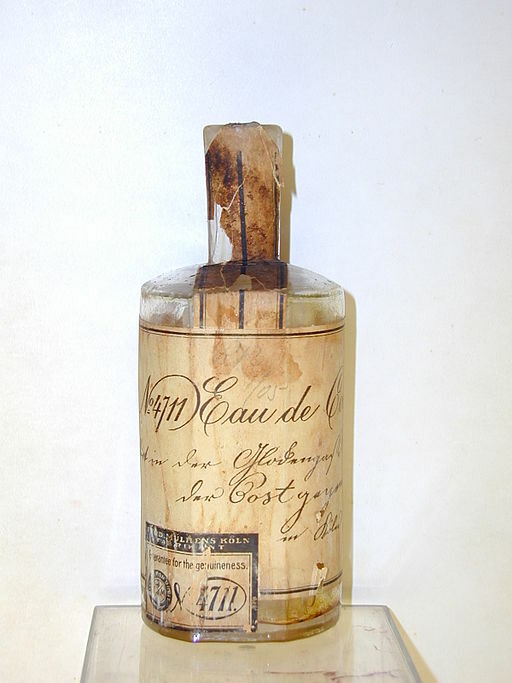 A 19th-century bottle of 4711 Eau de Cologne. Image: Farina Archiv. In An Evil Spirit and other contemporary literature, the well-to-do woman who drinks confirms established stereotypes of feminine behaviour: women are skilled in the art of subterfuge and use the substances at their disposal (make-up, perfume) to mask their true nature. Several doctors noted how drinking encouraged women’s ‘natural’ proclivity to dishonesty, as they lied to those around them and tried to hide their habit from view. A large part of this was likely due to the shame that came with a drinking habit, as even medical conceptions of addictive behaviour at this time carried in them a degree of moral judgement. This shame also complicates the historical study of the cologne drinker: she is a rather elusive figure, popping up only occasionally in doctors’ anecdotes or as a sensational figure in the press, making it difficult to place her squarely in the realm of either fact or fiction. 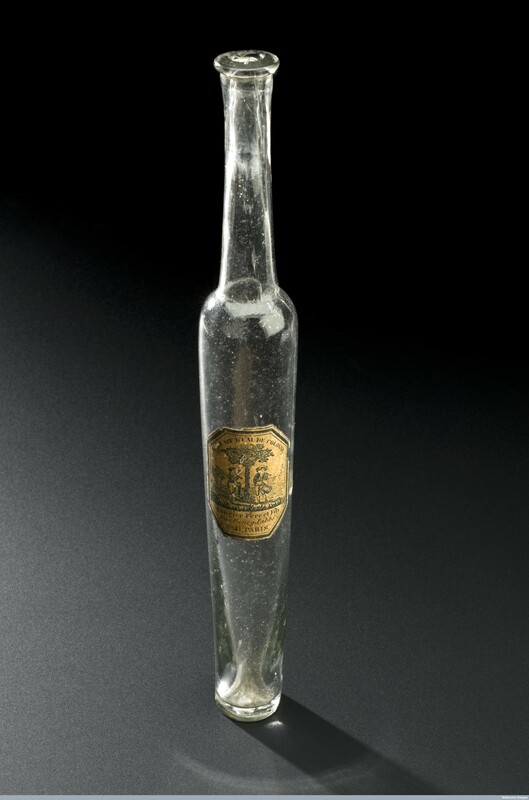 A French Eau de Cologne bottle, 1780-1850. Image: Wellcome Images. The Victorian perfume tippler might seem like an amusing character (and the very word ‘tippling’ suggested a more innocuous activity than the ‘drinking bout’ typically attributed to men), but doctors writing on the topic emphasised that the practice was far from trivial. To many, the resort to substances like Eau de Cologne was a sign that a woman had a long-standing drink habit, with her quaffing of perfume proof of the desperation to obtain alcohol in any form. W.C. McIntosh, writing in 1866, listed some of the substances that were ‘gulped down’ when a person was deprived of their usual alcohol or drug of choice: ‘red lavender, lavender-water, eau de cologne, creosote, vinegar, [and] vitriol’. The late 19th century was a period when the range of potential intoxicants – socially acceptable or otherwise – was increasing. The contents of journals like the Quarterly Journal of Inebriety testify to doctors’ anxieties about dealing with these new substances – everything from cocaine to camphor, from morphine to medicated wine. Tackling the abuse of substances like Eau de Cologne was difficult, however – one could hardly remove all potentially intoxicating products from sale. The resort to substances not designed for human consumption is a problem that doctors continue to face in the 21st century – such as the drinking of hairspray in ‘dry’ rural Alaska. Although these modern-day drinkers may look a lot different to our 19th-century perfume tipplers, a common theme that unites them is the lack of legal or socially-sanctioned access to alcohol – a situation leading to the regular consumption of potentially dangerous alternatives. Advert for a scent bottle from Chemist and Druggist, February 1890. I’ll be talking about the drinking habits of 19th-century women as part of Oxford Open Doors 2015, with Melissa Dickson from the Diseases of Modern Life team also joining me to talk about metals, magnets, and hysteria. You can find us at St Anne’s College from 3.15 on Sunday 13 September – we hope to see you there! The Constructing Scientific Communities: Citizen Science in the 19th and 21st Centuries and Diseases of Modern Life: 19th Century Perspectives Projects will be taking part in Oxford Open Doors 2015 organised by the Oxford Preservation Trust. Oxford Preservation Trust’s printed programme contains an error on the date, as the events are listed for Saturday 12th September. Please note that the correct date for these events is Sunday 13th September 2015. A programme of talks and activities will be held in the Mary Ogilvie Lecture Theatre and Foyer, St Anne’s College, Woodstock Road on Sunday 13th September 2015 between 1.30 – 4.30 p.m. There will also be a talk by Professor Gary Browning from Oxford Brookes University on Iris Murdoch, one of the most eminent previous fellows of St Anne’s College. 1.30 – 4.30 p.m. Citizen Science and Zooniverse talks and demonstrations throughout the afternoon (Foyer area). Members of the project team and Zooniverse, the world’s largest citizen science platform, will be there all afternoon allowing visitors to try citizen science for themselves. The talks during the afternoon will look at the history of citizen science. One frequently made observation about the nineteenth century is that it was marked by a number of breakthroughs in medicine and the sciences which revealed forces that shape humanity – as individuals and as a species – whose existence was previously unsuspected. Our understanding of ourselves was changed at a fundamental level by the new knowledge of these hidden operations that had been invisibly at work within us since prehistory. Darwin’s theory laid bare the contingency of our existence in the struggle for survival, while Freud pointed to the seething chaos of the unconscious. Man’s inner world was suddenly mappable, yet worryingly more obscure at the time. Untold volumes have been devoted to the defining shifts these two theories brought about and the anxieties they produced, observable in seemingly every facet of life, the subject’s vastness and complexity defeating any meaningful attempt at summary. Easier to take in at a glance is the somewhat less epochal advance that accomplished a similar kind of inside-outing: the advent of the stethoscope. Credit for the invention goes to a young French physician René Laennec, who spent the early decades of the nineteenth century investigating the correlations between his patients’ bodily sounds and their medical conditions. 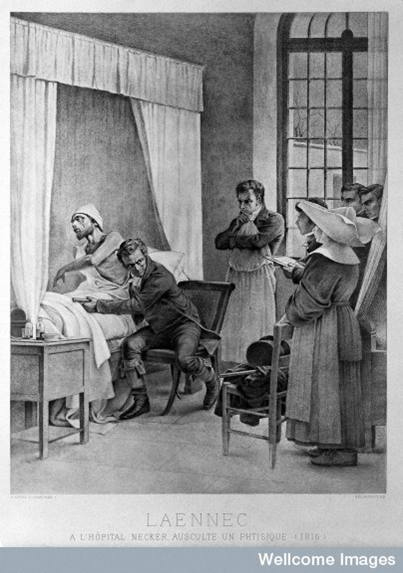 His research initially took the form of a long and painstaking process of carefully matching the sounds he detected during his assessment of patients with the physical changes in diseased organs that could he observed during their subsequent autopsies, Laennec evidently subscribing to the “eggs for omelettes” theory of medicine. He stumbled upon the device for which he is remembered when, in 1816 while struggling to examine an obese girl with symptoms of heart disease, Laennec rolled up a piece of cardboard, applied one end to his patient’s chest and the other end to his own ear, thus creating the first stethoscope. Elaborating on this concept to design his wooden, cylindrical tube, pictured in use here at a Parisian hospital, Laennec published in 1819 a 900 hundred page treatise on the art of mediate auscultation, filled with descriptions of the various normal, abnormal, and pathological sounds he had detected through use of the stethoscope and the diseases they signified. There were inherent difficulties, however, in describing the various sounds the stethoscope made audible that were to tax Laennec’s metaphoric reserves to their utmost. While some descriptions where relatively straightforward – the rush of wind through a small orifice, for instance – others were decidedly outlandish. He likened a particular lung condition to the creaking of the leather of a new saddle, and yet another to the sound produced by stroking the head of a cat while the animal is purring. The stethoscope has long ceased to excite merely professional interest. There are few families to whom it has not proved an object of horror and the saddest remembrance, as connected with the loss of dear relatives […] As an instrument on which the hopes and fears, and one may also say the destinies of mankind, so largely hang, it appears to present a fit subject for poetic treatment. A very trump of doom. That the fought-for prize shall win?